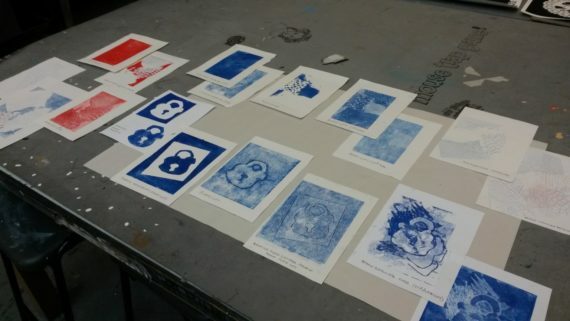 I have been testing and preparing examples using lino and monotype techniques. I made these ready for January as I have been asked to deliver a printmaking course at the Ipswich Institute nearby for the spring term. I think I will experiment more with the use of lino printing for myself, as I have not created lino prints with transparent layers. The students the other week were using extender base to do this with Dale the tutor. I have used extender with etching and I have used transparent layers in my screen printing, but not with lino. I think perhaps it is that I had always considered block printing as being very solid. I think I will revise my thoughts about that. A residency for me seems to provide the best vehicle for indulging in your practice, not just the set aside time and facilities, but interactions with others as ideas proliferate. Robin Warnes the fine art tutor discussed my work with me a couple of weeks ago and I now have to research Tracy Emin, as I am curious, after he mentioned her in relation to one of the pieces I was making. I am not sure why, especially as I thought others did her printmaking for her, er, not even sure about that now. 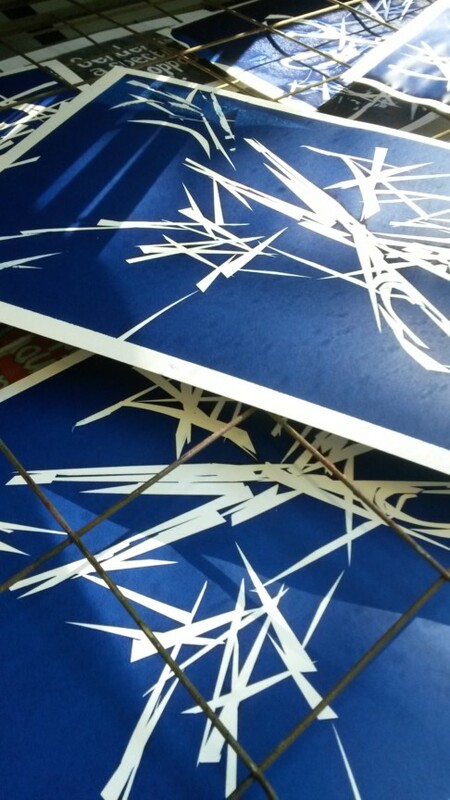 Ralph Overil is an interesting printmaker who I met while I was running the AA2A residencies at Chelmsford College, and I often wondered how it would be to see things from the other side rather than a teaching perspective. And now I am the resident artist, it does look quite different. So many new ideas and developments emerging as I work. I have ideas to bring print and painting together, as well as trying new techniques previously mentioned but I guess there are more ideas than time.